Home > Uncategorized > I’m back…. It is amazing what impact 5 litres of cold water filled with electrolytes and magnesium, a large meat feast pizza, lying in an air conditioned room and getting ten hours sleep can do to a tired body. Even if you are an old geezer like me! Anyway, my apologies for that lame “woe is me” blog of yesterday. As of today, my mojo is well and truly back. Because of the extra miles of yesterday, plus the significant difficulties we now face in trying to find suitable exits (note – Paddy explained some of this in his blog yesterday. Essentially all the land either side of the river is owned now by petro chemical businesses and as such are potential targets for terrorists. Therefore they – homeland security and the coast guard, which are responsible for security – are less than keen to have strangers pitching up at their plants), today was a ludicrously easy paddle of around 20 miles. Compared to yesterday, barely worth changing into your rowing kit! In any event, I was very grateful to have Gavin Sayers, who has returned for a second spell with us, to pull me along and we positively ate up the miles. Steered by Mel, we weaved between moving super tankers, avoided massive barges, and swerved around solo tugs and launches. She is especially good at waving happily to the bridges of these boats, whilst cursing them under her breath, using terms which I can only assume she learned in bars in Sydney. On that note, can I just say that I have been really disappointed by the general (not total) attitude of the skippers of the big tows that work this river. We have listened to them talking to each other on our VHF marine radios and the comments between them about us have been at best dismissive and at worst derisory and insulting. It was ok that they referred to us as “kayakers” and only once in three months did anyone call us “rowers”. But I balked at them saying “these guys don’t know what they are doing or where they are going”. Frankly, given that between me, Paddy and Graeme, we have about 100 years experience of navigating on rivers and, in comparison to what we have seen of these guys we have so far not run into bridges, dams, locks or run aground – all of which we have seen them do. It came to a head yesterday when one said to us “why don’t you just jump off a bridge if you want to kill yourself. Out here you will get run over by ships”. Ah, Southern hospitality at it’s very best. The wind is now fixed from the NE, but feels strongly East just now and through to the finish. The troops are now gathering and we are making plans for the next two days. Tomorrow, I will row with Simon Holden with Jerry Dale steering – he needs new blood to tell his stories to and he has worn down the rest of us. Poor Simon! Paddy will row with Derek Mayne with Mel steering. It will be a long day of 42 miles, but should be fun. We have Julie and my son Charlie joining today together with her dad Harry, back again. Derek’s wife Kathryn arrives tonight too. 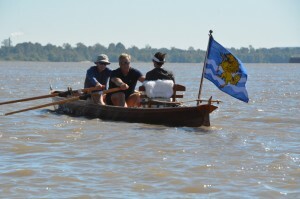 We then plan to have a river boat take everyone down river with us on the last day, dropping people in and out of the skiffs during the row so all can feel a part of the last push. Endless plans being discussed for various bars and restaurants, what we want to drink when we finish (Sam Adams? Champagne? I will have two or three litres of water as I will drink everything at the same pace, so need to rehydrate fast!). Then we will be able to kick back and begin the overwhelming task of trying to take in what we have achieved, I cannot begin to imagine yet how it will feel, but I have to tell you that I am truly beginning to feel excited, emotional and not a little relieved. I had significant doubt about whether I had “the Right Stuff” to accomplish this. At the moment, the indication is that I just might. Amazing what abit of “Adam’s Ale” and “additives” can do for a body! Good to read your latest blog. Now you will be able to enjoy your final push and wonderful achievment. All will be well and you and Paddy will have done much for the children who will learn so much through play. Simply amazing! Congratulations on what you guys have achieved. A physiological, psychological, nutritional, medical challenge of immense proportions. Enjoy the celebrations when you finally cross the line and look after yourselves in the coming days. You’re never far from my thoughts in these final stages, can only imagine how excited you must be to be so close to achieving your goal.. Your in Louisiana! You’ve got to drink Abita Beer, or NOLA Brewing, Tin Roof, Bayou Teche, Parish, anything local! Congratulations on the extraordinary journey! John, I never, for once, thought that you were not made of the ‘right stuff’. What you, and your team, have achieved is absolutely fantastic. You’re not going to know what to do with yourselves in a handful of days, so make sure you have plenty of ears who want to hear of your exploits, as something like this will need to be relived for a while to come. You need to talk back to those skippers and tell then exactly what you were doing and shame them into donating. Well done, all of you, and a enjoy your last few miles. Dance hard in New Orleans. We will be thinking of you. There are a lot of us who are immensely proud to have been in that number and played our small part. To you guys who have lived the immensity of the challenge from start to finish, I salute you. Glasses, bottles, whatever you decide, will be raised in your honour. Wishing you a triumphal entry into New Orleans with the adulation of the crowds ringing in your ears and a rather fine weekend to follow. I’m with Jerry on this one – immensely proud to have played a tiny part and in awe of what you have achieved. It is was great fun and a huge privilege to have experienced at first hand the majesty and scale of the Mississippi and to have understood the sheer magnitude of the challenge that you took on, rowing day after day, week after week and month after month. My thanks to you and Paddy for sharing the experience, and to Graeme, Alex, Mel, Magenta and the rest of the shore team for your considerable effort and hard work ensuring that the boats, the team, and we occasional rowers who cheerily dropped in for a day or two were all in the right place at the right time. An inspiring cause in Right to Play, a fabulous team effort and a quite stunning achievement. Huge congratulations from all the Green family and we’re sorry we can’t join you for the final hurrah in New Orleans, and if for a moment you should flag during the after-party, pick yourself up, pick up a drink (pick and lean, boys, pick and lean) and please party really, really hard for us as well.